How to Reclaim Return Fees? 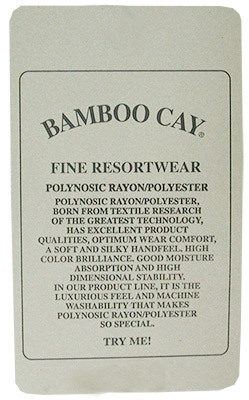 Santa's Christmas Layover Men's Bamboo Cay Embroidered shirt is Avaialble in Snowball White in 3X - last one. Men's Bamboo Cay Christmas shirt is a Hawaiian style shirt with intricate embroidery on the Polynosic silk-like fabric. The fabric looks and feels like silk and wears like silk but is much less expensive than silk. : sold out in all sizesWHEN MAKING YOUR SELECTION: It's always agood idea to choose an alternate print or color justin case the item has become Temporarily Out of Stockor has Sold Out. This will prevent delays, refundsand partial shipments. You can choose youralternate/s by using our (Special Instructions Box)located below the area where you enter your emailaddress while checking out.YOUR SELECTION CHOICES ARE IMPORTANT TO US:We will NEVER substitute a purchase with analternate without your approval.SALES UPDATES: Are posted daily. And all listingsare subject to prior sale. Detailed inventoryinformation can be found by clicking on the link(Available Selections Information) located on thebottom area of any page throughout MauiShirts.com.Mahalo. Note: If in between sizes then purchase the bigger size. The measurements within this size chart were obtained from the Bamboo Cay Embroidered shirts and are NOT measurements from any body. The Chest measurement of the shirt is realized from a measurement taken from approximately 1/4" under the armpits from side seam to side seam. Measure the back or the front of a shirt in your wardrobe, from under the armpits, and then DOUBLE this measurement to obtain the chest size of the shirt. Compare this measurement from a shirt in your wardrobe to the size chart above to purchase the correct size. The Length measurements are taken from the middle top of the collar down to the bottom of the shirt hem. Questions (Maui | Hawaiian Islands | Aleutian Time: 808-661-1536. MauiShirts features made in Hawaii and shipped from Maui clothing manufactured in Hawaii. A 2018 brand name's List. Some have been creating Polynesian, Hawaiian and tropical prints and styles for more than fifty years: Paradise Found, Waimea Casuals, RJC, Robert J Clancey, Kalaheo, Puanani & Shannon Marie, Two Palms, Bamboo Boxer, Pacific Legend and Rainbow Jo. New prints and aloha styles are added frequently. 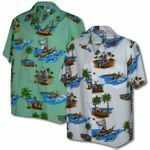 MauiShirts offers an unmatched assortment of cotton, made in Hawaii, matching Family Outfits from infants to grandpa and grandma. In the Hawaiian language they would be called Keiki (Children) to Tuku Kane or tutu kane or simply TuTu. Type most any polynesian, tropical, hawaiian word or short phrase, print name, or specific STOCK NUMBER to view images related to your search. Click Below to Track your Shipment or Delivery Confirmation. Got a question? Email Mickey Steinborn, President, MauiShirts.com, Inc. The images depicted on all pages of any Hawaiian shirt or Hawaiian dress is a random selection of the print. There are no two prints that are identical; every man's shirt print, boy's shirt print, girl's or women's dress print will be slightly or somewhat different. MauiShirts.com, Inc., Michael (Mickey) B. Steinborn reserves the right to do, or not to do, business with you. If you attempt fraud, are abusive or rude in your communications your email address, name will be removed from our monthly email special sales. MauiShirts.com, Inc. will not tolerate rude and disrespectful people. We do business with a spirit of Aloha. We practice Aloha. We will not accept new orders from any customer if untrue, unfounded, negative remarks, feedback is posted in the Yahoo public forum. The Yahoo public forum is something we enable for you. It is there for us to improve our service to you and others. It is not there for you to make unwarranted remarks or comments. Copyright © 2019 MauiShirts.com Inc., Michael (Mickey) B. Steinborn - Copyright © 1998 - 2019 MauiShirts.com - Copyright infringement is a civil and criminal offense. Willful violation can result in penalties up to $ 100,000.00 per infringement. No portion of this web site, MauiShirts.com Inc.; images, photographs, text, may be reproduced by printing, photocopying or by any other means of mechanical or electronic reproduction without the express written permission from MauiShirts.com, Inc.